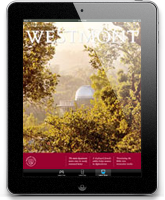 Until the early 1990s, Westmont lacked a systematic way to preserve historical materials. Old yearbooks, scrapbooks, photos, catalogs and publications were piled haphazardly in the basement of the library in a room with the rare books. Doing research required sorting through the multiple, chaotic stacks. After her 50th reunion, Thelma Bain Kramar ’41 gathered a group of alumni to tackle the archives. From 1992 to 1994 they traveled to campus to identify photos, organize information and donate their own memorabilia. In 1996, Professor Paul Wilt retired after teaching history for 36 years and became the first part-time archivist. He continued conducting oral histories of early faculty and administrators and began writing about each of the college’s founders, presidents and buildings. His careful work finally brought organization and access to the archives. By 2005, Wilt was ready to retire again. At the same time, Corey fortuitously asked about working with the archives. She had returned to campus when her husband, Greg Thomas ’94, became resident director in Van Kampen Hall, and she was eager to use her experience with one of Wheaton’s archival collections. That summer, she filled the need for a part-time Westmont archivist. In just a few years, Corey has transformed the room into a professional archive, with all materials inventoried, organized and stored safely in pale blue, acid-free storage boxes. Not only do these containers make information easy to access, but they can be removed quickly in case of a fire or other emergency. An anthropology major at Westmont, Corey has always liked history. To pursue a career in Christian camping, she earned a master’s degree in educational ministry at Wheaton College. That’s where she met Greg, a fellow Westmont alumnus getting a master’s degree in evangelism and spiritual formation — and where she became an archivist. Working for a Wheaton professor writing a history of the YMCA gave her archival experience and led to her position helping colleagues care for the college’s famous Wade Collection. 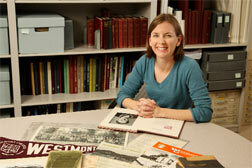 Interested in possibly donating Westmont memorabilia to the archives? Contact Corey at archives@westmont.edu for more information. I am Ruth Kerr’s granddaughter. 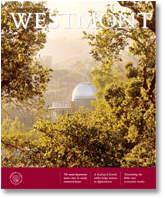 My brother, sister and myself all attended Westmont. I graduated with the class of ’70 and currently live in Portland, OR and my brother and sister live in Colorado. My brother has many personal items pertaining to our grandmother and I know he contacted the college years ago about donating some things but at the time there was no place to put it (I think). Are you interested in finding out more about this? If so, I can connect you with my brother and he can give you more specifics. We love Westmont, of course, and would love to see these things become part of the history which people there can actually see and appreciate. I come to Westmont every 5 years for my class reunion and if you would ever like to meet, just let me know. My brother was in the class of ’69 but graduated in ’70 after doing his 5th year.